SAFETY FIRST: Anglican Care staff with their award. Picture: Supplied. ANGLICAN Care has won an award for its use of wearable sensor technology to minimise manual handling injuries sustained by its laundry and hospitality staff. 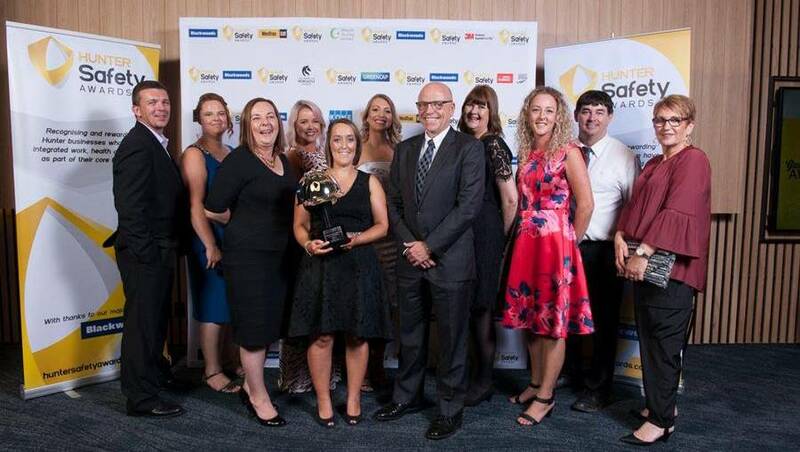 The company won the workplace health and safety innovation category at the recent Hunter Safety Awards. It edged out contenders from the mining and industrial sectors. “In conjunction with biotechnology company dorsaVi, Anglican Care conducted an objective and quantitative overview of the physical demands on laundry and hospitality staff using their state-of-the-art analysis equipment,” a spokesperson for Anglican Care said. The biotechnical company consulted with Anglican Care staff and took expert advice from allied health and engineering experts to pinpoint the highest risk elements of the job. “The data identified that loading and unloading of industrial washing machines and food trays from trolleys, waste removal, and movement of cleaning equipment were the most ‘at risk’ tasks,” the spokesperson said. Each were found to have elements of repetitive spinal flexion, sustained elevation and internal rotation of the shoulder. Anglican Care chief executive Colin Osborne said the innovation had made a real difference to the company’s workplaces. “This award is recognition of the incredible talents and dedication of our WHS team, who have worked tirelessly to reduce injuries in our organisation,” he said. Anglican Care have since engaged dorsaVi for further risk management assistance, and baseline studies on care staff have now been collected. This data will be reviewed as Anglican Care continues to roll out interventions across the organisation. Anglican Care owns and operates a range of aged care services and facilities in NSW, including in Lake Macquarie and the Central Coast. Amongs its local operations are Kilpatrick Court, in Toronto, C A Brown, in Booragul, and Warnervale Gardens, in Woongarrah.